They spent the morning snapping pictures of anything that seemed interesting to them. 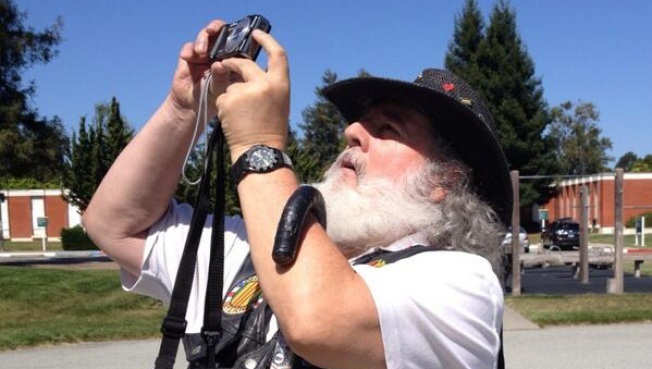 Ontiveros fought in the Vietnam War, and now he’s enrolled in a photography therapy class at the Menlo Park Division of the Veterans Affairs Palo Alto Health Care System. The class is part of an alternative therapy program for veterans who suffer from post-traumatic stress disorder or other mental illnesses. “It’s an alternate way for them to be able to talk about and express themselves as part of their recovery,” art therapist Jeffrey Stadler said. The program began last summer and averages 10 veterans per 6-week class. “I was the target of military sexual trauma in boot camp,” U.S. Army veteran Christine Stout-Holmes said. The veteran said she held in her abuse and became a good soldier, but was no longer able to hold in her depression, and sought help at the VA.
She took a picture of a huge Redwood tree in class. “If you keep looking at the tree it gets smaller and all of a sudden you look at the branches, and those are my support people, my art therapy, my friends, my counselors,” Stout-Holmes said. John Wilson is also a Vietnam War Veteran taking the photography class. “I still have problems with it today," Wilson said. "I still have dreams today. Sometimes I hear gunfire in East Palo Alto and I still duck. It never leaves you. No matter how much treatment, you still have it. It's in the back of your mind." Wilson said the class is helping him cope. “I gives you a chance to focus on life around you. You focus on life around you and it looks a lot better,” Wilson said. No one here believes they’ll get rid of their PTSD. But with the camera lense, veterans like Ontiveros said 40 years after combat, life is finally beginning to come into focus.